We strongly oppose the FDA extending its jurisdiction as proposed in the Deeming Document, and specifically oppose any attempt by the FDA to regulate handmade cigars. However, if the FDA moves forward with the regulations proposed in the deeming document, it should employ the exemption proposed under Option 2, with the following changes: (1) any reference to cigar pricing ($10 or otherwise) should be eliminated from the definition of cigars exempt under Option 2, and (2) the requirement that cigars not have characterizing flavors should be eliminated. Cigars are fundamentally different from cigarettes and most other types of tobacco. As the Publisher and Editor-in-Chief, respectively, of StogieGuys.com we have been writing about handmade cigars since 2006 and have published thousands of articles and over 750 reviews of handmade cigars. The very nature of our site shows why FDA regulation of handmade, or “premium,” cigars is unwarranted. A similar site about cigarettes would never exist and could not generate the readership that our site has because cigarettes are a nicotine delivery device, while cigars are a handmade product which exists completely independent of its ability—or more realistically, relative lack of ability—to deliver nicotine. What makes certain cigars good or bad has nothing to do with the nicotine content, and everything to do with the skill that went into making and blending them. For a person seeking to fulfill their addiction or desire for nicotine, handmade cigars will always be an unappealing and irrational way to attempt to fulfill that desire. This is particularly true for minors (for whom purchasing tobacco products are already illegal) because they will always have more access to other tobacco products, and will always find that there are easier ways to obtain nicotine through products that are already approved under existing tobacco regulations. The FDA should not extend authority at all, and certainly not to handmade cigars, because it lacks the ability to do so. The FDA, like all government agencies, has a limited budget (our national debt is currently increasing at over $2 billion every day), which is why the real question the FDA should be evaluating is not “Should the FDA should regulate cigars?” but “Should the FDA divert resources from its other activities, including existing tobacco regulations, to regulate cigars?” The answer clearly is no. The FDA has not shown it has the capacity to carry out its existing tobacco regulations. Of the thousands of new products waiting for approval, only a few dozen have been ruled on so far. This demonstrates the FDA does not have the capacity to extend its regulations to handmade cigars. The FDA is specifically not authorized by Congress to ban cigars or other types of tobacco, and given the inability to handle existing pending approvals, expanding jurisdiction to handmade cigars would result in a de facto ban on new cigars because the agency has not demonstrated the ability to approve additional tobacco products at all, let alone in a timely fashion. Given that Congress mandated that the FDA regulate cigarettes, but left it up to the agency’s discretion whether or not to regulate cigars, the FDA should respect the priorities of Congress and not add cigars to its already overwhelmed regulatory jurisdiction. This is compounded by the number of new cigar products that are introduced every year. While there is no reason to believe that new cigars are at all different in their impact on public health (new products are almost entirely made by changing the blend and ratio of tobaccos used in existing products) every year hundreds or even thousands (if new sizes are each considered a new product) of new cigars are introduced. This would overwhelm existing FDA product approvals and make it more difficult for the agency to fulfill its core mission of regulating cigarettes. If the FDA erroneously chooses to regulate cigars, it should adopt a premium handmade cigar exemption that doesn’t rely on an arbitrary price, or flavor distinctions. In the Deeming Document the FDA proposes Option 2, which includes an exemption for premium cigars. This is an important realization of the fact that premium handmade cigars do not pose the same public health concerns that cigarettes do. However, the arbitrary and unscientific $10 price floor should be abandoned. Simply put, there is no scientific or public health reason for the exemption to rely on a $10 retail price, and the FDA has never demonstrated that one exists. Furthermore, the arbitrary price point doesn’t reflect any reality of the handmade cigar industry. If the FDA insists on a price-based definition of handmade or premium cigars, it should look to Congress to draw the line. To the extent Congress has drawn such a line, it did so in the SCHIP tax rates, which decided to limit taxes to the first 40.26 cents of the wholesale price per cigar. More importantly, any definition that includes production techniques will make it impossible to produce a cigar below a certain price, which sets an organic, as opposed to an arbitrary, price definition. “Flavored” or infused cigars also represent an arbitrary and unscientific differentiation that should be rejected. No evidence that we know of, or has been presented by the FDA, demonstrates that these cigars pose any additional public health risks. For these reasons, if the FDA intends to base its regulations on scientific evidence and not on arbitrary standards, it should reject any definition of premium or handmade cigars that includes flavor or a price, while it adopts an exemption for premium handmade cigars. FDA regulations on premium cigars will cost jobs, both domestically and abroad. It should also not go unnoticed that aside from the dubious public health justifications for regulating handmade cigars, there are significant human costs to such regulations. Thousands of jobs within the United States would be put at risk if the FDA regulates handmade cigars as proposed, and tens of thousands of individuals in developing countries (particularly the Dominican Republic, Nicaragua, and Honduras) would lose one of their best opportunities for a good job. The burdens that proposed FDA regulations pose to small businesses—whether cigar shops in this country or cigar factories abroad—would have a huge costs and eliminate countless jobs, especially in places where good jobs are very hard to find. So while regulating cigars would accomplish little if anything in regards to public health here in the United States, it would effectively doom tens of thousands of people to worse lives. Any calculus for public health should not ignore this serious impact. The FDA should focus on existing regulations, not expanding new regulations to handmade cigars. Given the existing backload of tobacco products waiting for a ruling from the FDA, it is clear that the agency lacks the resources to regulate cigars. 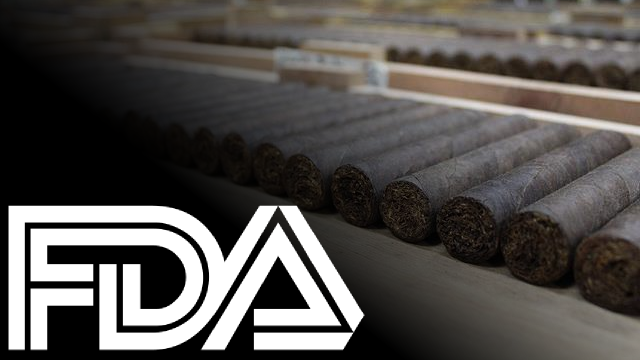 Because diverting limited resources to regulating cigars means less resources for other FDA activities—specifically other tobacco regulations—regulating handmade cigars is not only unnecessary but actually detrimental to the FDA’s public health goals. To the extent there is any doubt on this issue, the FDA should defer any decision on regulating cigars to a later date after it proves capable of fulfilling its existing mandate to regulate cigarettes and other types of tobacco that can have a substantial impact on public health. As handmade cigar smokers and experts writing about the industry daily since 2006, it is abundantly clear to us that handmade cigars are inherently different from other tobacco products. In proposing an exemption for premium cigars it did just that, but it did so in a clumsy and arbitrary way. If the FDA is serious about fulfilling its Congressionally-authorized mandate, it should not expand its regulations to include handmade cigars. However, if the FDA insists on expanding oversight it should adopt a broad exemption for handmade premium cigars that does not include a characterizing flavor or arbitrary price definition. Failure to take these suggestions into consideration will make clear to cigar smokers and the premium tobacco industry that the FDA is less interested in public health and more concerned with stifling cigar innovation, eliminating cigar-related jobs, increasing the costs of cigars, and limiting the ability of consenting adults to enjoy premium cigars. When exactly do we learn what the FDA has decided? And in your opinion, Stogie Guys, how damaging will the final outcome be for the cigar industry and us individual smokers? The rules that the FDA decides upon are expected to become final by next summer, with legal challenges expected to be filed almost immediately. As to the impact, it all depends on whether premium cigars are granted an exemption and, if so, what that exemption applies to. If there is no exemption, my own opinion is that the industry and the hobby will be pretty much devastated from what we now have. It's quite possible — I would say likely — the FDA will not implement anything by next summer. There is no deadline for the FDA to act, and like menthol cigarettes, they can sit on the proposal indefinitely. With the complexity of the issue, bipartisan opposition, and the fact that they have much bigger issues with menthol and e-cigarettes, I think they will hesitate to do anything quickly. While I hope (and asked the FDA for) for an exemption for premium cigars, it makes far more sense to exempt nothing than use a very high, arbitrary price point on what is discussed as a health issue. FDA is not handling the processing of new cigarette blends very well, and I am sure some at the agency are reluctant to take on a produce used by a small number of adults that is mostly made overseas and will cause trade headaches. If the regs come to pass, I don't think it will be the end of the hobby, although new blends will be rare for some time. The increased taxes caused by regulation are pretty small, and they won't remove brands on the market despite the post-2007 rules in the proposal. They didn't do that with cigarettes and won't with cigars. And like you said, when/if ever rules are announced, they will have a start date and then lawsuits will delay implementation, possibly for years. Mike – I hope you're right, but I think you underestimate the anti-tobacco nature of the FDA and its leadership and their lack of recognition that premium, hand-rolled cigars are different from other tobacco products, as witnessed by the fact that the exemption was apparently not included in the FDA's original proposal and inserted at the demand of OMB. I do think the cigar industry did itself a disservice during the SCHIP discussion with hand-ringing and predictions of doom that I thought then were grossly overstated and that have been proven to be so. In this case, however, I think there is a significant danger to the industry without an exemption. I guess we'll see. I don't doubt the anti-tobacco forces at the FDA, but industries survive regulation all the time. Not that there won't be fallout. I am not surprised the so-called premium cigar exemption was not included in the original proposal. From a health perspective — the only one the FDA should care about — it makes no sense to exempt any type of tobacco. The idea of exempting something with a $10 price that smokes the same as another item that costs $5 makes even less sense. That said, clearly the lobbying had an impact, based on the suggestion of any type of exemption. The SCHIP lobbying in 2009 got the per-cigar tax ceiling changed from $10 (where have I seen that figure before?) to 41 cents. I'd say that was a success, wouldn't you? There should be no debate. Regulating handmade cigars is akin to regulating wine blends, or artisan breads. You can't regulate subjectivity. You can't regulate art. This would be a serious waste of resources. Best to leave the industry alone. Tax the hell out of it if you must, but leave the craft to the artists. Better the FDA spend their time and resources with the genetic modification debacle. Thank You Gentleman, what a great job of fact and honesty in your commentary. Thanks again.